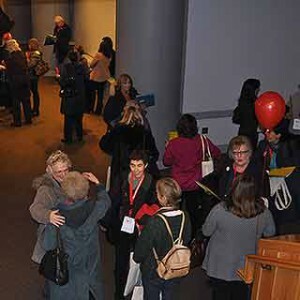 Princeton Community Works is an annual educational conference for nonprofit boards, staff, and volunteers. It was founded by several members of the Rotary Club of Princeton. Volunteers check in 400+ people at the conference. A Planning Committee of local volunteers committed to the non-profit community and who believe in the mission of Princeton Community Works was created to develop and manage the annual conference, in keeping with our mission to enable non-profit boards, staff, and volunteers to learn and grow effectively. We serve the large non-profit and volunteer community in the greater central New Jersey area. Participants gather and chat before the general session. The Planning Committee develops the workshops, networking events, and overall logistics of the conference, meeting and communicating from September until the event in January. Post-event evaluation and review takes place following the conference in order to maintain a quality program.